The first course of chemotherapy damaged her mother's heart, so she was not physically strong enough for many treatments the second time around. Dr Behan told the BBC: "This is so important because currently we treat cancer by treating the entire patient's body. We don't target the cancer cells specifically. "The information we have uncovered in this study has identified key weak-spots of the cancer cells, and will allow us to develop drugs that target the cancer and leave the healthy tissue undamaged." Cancer is caused by mutations inside our body's own cells that change the instructions written into our DNA. The researchers embarked on a gargantuan feat of disabling each genetic instruction - called a gene - inside cancers, to see which were crucial for survival. They used a tool called Crispr - the same genetic technology that was used to re-engineer two babies in China last year. Others are already the target of precision drugs like Herceptin in breast cancer - the team called this a "sanity check" that proves their method works. One potential target is "Werner syndrome RecQ helicase" also known more simply as WRN. The eventual aim of the research is to develop a "Cancer Dependency Map" of every vulnerability in every type of cancer. Then doctors would be able to test a patient's tumour and give them a cocktail of precision drugs to kill the cancerous cells. 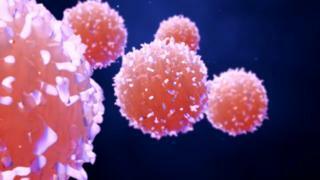 Dr Behan told the BBC: "Were understanding what's going on in the cancer cells so we can shoot our machine gun at the cancer cells, not at the whole body as chemotherapy does. Prof Karen Vousden, Cancer Research UK's chief scientist, said: "What makes this research so powerful, is the scale. "This work provides some excellent starting points and the next step will be a thorough analysis of the genes that have been identified as weaknesses in this study, to determine if they will one day lead to the development of new treatments for patients."